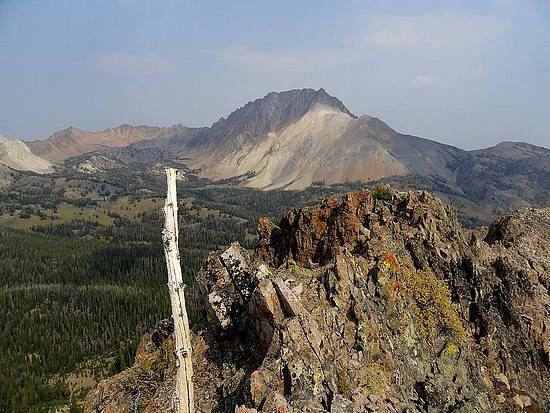 One of the most popular hiking destinations within central Idaho's White Cloud Mountains is Chamberlain Basin, located at the foot of Castle Peak. Many folks visit the area as part of a backpacking loop, or to climb Castle Peak. But very few people explore the scenic stretch of ridgeline that forms the southern edge of Chamberlain Basin. The ridge is made up of three peaks, and makes for some fun exploring with great views and lots of solitude. For identification purposes, I'm referring to the peaks as West Chamberlain Peak (10405'), Jack Chamberlain Peak (10108') which is a Rick B name, and East Chamberlain Peak (9980'). I was up early on this very smoky morning. After a nearly 4 hour drive from my house in south Boise, I made it to Three Cabins Creek trailhead and was on the trail by 7:45am. A high clearance vehicle is required on the Pole Creek road. You can actually get even closer access by driving up the jeep road to the Washington Creek trailhead, but I was planning for a 15 mile loop that would make Three Cabins a better starting point. From the trailhead, it was a slight downhill grade for a mile and a half until I reached the junction for the trail heading up Washington Creek, where I hung a left and headed uphill. But the trail was in great shape and had a mostly gentle grade, so I was able to keep a good pace. Even with all the forest fire smoke in the air, I still had good views of Washington Basin to the west and the Germania Ridge behind me to the south. With only a couple photo stops along the way, I covered the 5.7 miles to the saddle above Chamberlain Basin in just under 2 hours. I don't normally hike that fast, but I was motivated to stay ahead of the clock given the long day I had planned. At the saddle I stopped for a snack while enjoying the classic view of Castle Peak towering over Chamberlain Basin. I had the place to myself, which is rare on a weekend, probably because of all the smoke in the air. After catching my breath, I headed northwest up the gentle ridge about a half mile to "West Chamberlain Peak". The peak is a little light on prominence, but it is the highpoint of the ridge and a good looking peak, so I give it the benefit of the doubt. The views from the summit were great, and I could now see the rest of the ridge strung out below to the southeast. I didn't stay long on West Chamberlain before retracing my steps back down to the saddle, then continuing southeast along the ridge. Most of this section is fairly open and terrain. But as I got closer to "Jack Chamberlain Peak", I could tell it would be an interesting climb. The gentle ridge turned rugged, and the way to the summit wasn't obvious. But with some route-finding, I made it to the top without exceeding class 3. There was some fun scrambling leading to the summit of Jack Chamberlain, and the views of Castle continued to be fantastic. The biggest mystery of the day was how the ridge work would be on the east side of Jack Chamberlain. The map made a traverse look questionable, but I just took my time, and found my way by weaving back and forth between a few towers, and then the terrain mellowed out again. In the mellow section, I kept myself entertained by checking out a variety of different rocks along the way. Soon I spotted a mountain goat sunning himself not far ahead of me. He wasn't too concerned as he leisurely got up, stretched, and then wandered off to the east. The west ridge of "East Chamberlain Peak" was no problem, and I was on the summit in no time. On top, there was NSPSV other than a bunch of hoof prints. I built a small cairn using some of the interesting rocks I had in my pockets from earlier, and then settled in and enjoyed my PB&J while soaking in the views of Castle Peak and Chamberlain Basin. From here, it would be easy enough to retrace steps west along the ridge back to the saddle, but my plan was to head south down to the Germania Creek trail. From "East Chamberlain Peak", I wandered down the southwest ridge until getting stopped by rock towers, then angled to the west. The talus in this area was heinous, and progress was slow as I made my way though an immense field of loose rock. I was glad to eventually get down into the trees and off the talus, except for an unexpected grove of stinging nettles. Ouch! I attempted to side-hill along up high, but eventually got pushed down into the valley. I could tell the creek-bed usually contains a high flow of water, but it was just a small stream this late in the year. It ended up being a lot of fun scrambling down the rocks next to various little waterfalls, with a some tricky moves in a couple places. The unnamed creek valley was very pretty. Once at the bottom of the valley, it wasn't long before I found the trail and started the four-mile hike back to the trailhead. This section of trail is open to motorcycles, and I actually met two of them along the way. But the trail still has a nice wild feel to it, and the area was quite scenic. I tried to set a quick pace, and only had one extended break on the way up, pausing under a tree to wait out a short hailstorm. I made it back to the trailhead before 5pm, having covered the 15.5 miles in just under 9 hours. Another great day in my favorite mountain range. Map of the route, almost 16 miles and 4500' elevation gain round trip. Germania Creek in the morning. View of Washington Basin and its surrounding peaks. Classic view of Castle from where the trail crests the ridge. Looking up the ridge at West Chamberlain Peak. Castle Peak from West Chamberlain Peak. The full ridge veiled in smoke, from West Chamberlain. Jack Chamberlain Peak from the west. Impressive summit block of Jack Chamberlain Peak. Looking down the ridge toward East Chamberlain Peak. South face scramble route up Jack Chamberlain Peak. Castle Peak from Jack Chamberlain Peak. Looking back on Jack Chamberlain Peak from the east. Unique vantage point of Castle Peak and Chamberlain Basin from the south. Zoom shot of a goat near East Chamberlain Peak. Nearing the summit of East Chamberlain Peak. Huge log about fifteen feet off the ground on the way down unnamed creek. Typical terrain along the unnamed creek. Waterfall near the bottom of the unnamed creek valley.